I know how you feel when you went to a shopping mall or online store and see there are no dedicated laptop bags for women. All the laptop bags are built keeping men in mind, and they are like you can use it. I don’t want to use a laptop bag that is made for men. So I have done lots of digging to bring out the best laptop for women that is stylish, comfortable to carry and offers lots of functionality and most importantly the safety of your notebook. The first thing that you should look before purchasing a laptop bag is its quality and padding on the laptop compartment. All the laptop bag I am going to review today are super-cute, fashion forwarded laptop bag that will easily accumulate your precious laptop and fashion items and also ensures the safety of your essentials. These laptop bags are made of high-quality, durable material and have plenty of padding for the protection of you laptop. Ogio Midtown Women Laptop Bag is one of the best designer laptop bags for women available. Buttons on the front side of the bag, adds a stylish touch to this casual laptop bag for women. It is made of premium quality nylon material. Ogio Midtown Women Laptop Bag can comfortably house a 15 inch laptop with its fully padded fleece lined laptop compartment that comes with an elastic closure. Ogio Midtown Women Laptop bag features a flap closure that has Velcro so you can quickly access to the main compartment. This stylish laptop bag for women has a zippered compartment on the front side that is perfect for keeping your laptop accessories like charger, extra mouse, thumb drive, etc. On the backside, there is Velcro attached pocket which can easily accumulate most iPad and tablets. There is a zipper on the bottom of this pockets, if you unzip it, then it becomes a loophole for attaching the bag to a suitcase. It is a great feature for the traveler who doesn’t carry an iPad/tablet with them. Inside the bag, there is a front organizer compartment. It has two mesh type pockets for cell phone, camera, etc., Two pen slots, two small open sleeve and a large open sleeve pockets. Beside all these, it has a large zipper pocket on the top. So you can easily organize everything you carry. It has two primary compartments, one for your laptop which is fully padded on both sides and comes with Velcro protection. The laptop compartment can carry a laptop up to 15 inches. And another compartment is for your files and folder that is roomy enough to hold your other essentials. Ogio Midtown Women Laptop Bag offers two carrying option. You can either carry this fashionable laptop bag using top carrying handle or shoulder strap. The shoulder strap is adjustable and removable; you can adjust it to achieve a comfortable fitting, or you can remove it if you don’t like using the shoulder straps. Q.1 I am a college student, can I fit a laptop and some books? Answer: Yes, you can. It has dedicated laptop compartment, and the main compartment is spacious enough to hold your books. Q.2 What is the measurement of this bag? If you ask me which one I will choose among all the laptop bags on this page then I will go for Ogio Midtown Women Laptop Bag. It is constructed from durable nylon and interior features fully padded fleece lined 15 inch laptop compartment. It has organizer compartment and comes with padded top carrying handle and shoulder strap. What else do I need in a laptop bag at this price? It best laptop bag for women. Look no further, Grab it now!! Buy Ogio Midtown Women Laptop Bag on Amazon, Now! Are you looking for a cute laptop bag for women then Kayond Cute Leopard Spots Laptop Bag is the best option for you. You will fall in love with its beautiful printed leopard spots exterior. It is made of canvas fabric and comes with lots of organizer compartment and a dedicated 15.6 inch laptop compartment. This cute laptop bag comes with gold hardware detailing which stands out on printed leopard spots exterior. Kayond Cute Leopard Spots Laptop Bag is a dedicated laptop bag for women. It comes with top carrying handle that is well padded for a convenience carrying experience. Of course! Kayond Leopard Spots Laptop Bag comes with a shoulder that has plenty of padding. The shoulder strap is adjustable and detachable so you can detach if you don’t like carrying using the shoulder strap. It comes with large size front and back pocket. This laptop bag has two section; one is for your precious laptop that has plenty of padding. The bottom of the bag has been reinforced with more padding to make sure protection of your notebook. The dedicated laptop section can protect a laptop up to 15.6 inches. Inside the bag, there is a large zipper pocket where you can keep your iPad/Tablets or anything else you want to keep. The main compartment of the bag is spacious, designed to hold lots of accessories at once. You can keep your college books, files, folder and the other things. On the side of the bag, there are three slots for a pen, pencil, and other similar items. There is also two open sleeves for keeping cell phones, external hard-drive etc. Made of canvas Fabric and includes beautifully printed leopard spots. Laptop compartment with plenty of padding and reinforced the bottom. Can protect a laptop up to 15.6 inches. Padded top carrying handle and adjustable/detachable shoulder strap. Q.1 Can this bag stand on its own with laptop inside? Answer: Yes! It can, but it tends to lean a little bit. Q.2 Does this bag has enough padding to protect my MacBook Pro? Answer: Yes it comes with plenty of padding, and the bottom part has been reinforced with more pads, so I think MacBook Pro will be in safe hands. Buy Kayond Cute Leopard Spots Laptop Bag For Women on Amazon, Now! This stylish and practical 13.3 inch PU Laptop messenger bag from BRINCH keeps your precious laptop by your side throughout the day. Brinch PU Laptop messenger bag is made of durable PU material which is kind of waterproof. The water will not stick in your bag; it will just glide off. Like every other laptop bags, Brinch Pink Laptop messenger bag comes with top carrying handles and shoulder strap. What makes it different? It’s carrying handles and shoulder straps are well made. It looks so premium. This laptop messenger bag is the best deal for that price. If you like carrying laptop bag as a briefcase then simply just unhook the removable shoulder strap. If you are a traveler or busy women and wants to go hand-free and simply just hook shoulder strap, adjust it according to your convenience and enjoy the comfort of carrying. Brinch PU Laptop Messenger Bag comes with exterior pockets where you can keep your laptop bulky accessories and other items like an extra mouse, thumb drive, hard-drive, etc. Brinch Pink Laptop Bag comes with only one compartment that has been divided using a padded center divider. Laptop section has plenty of padding from both side, so it protect your laptop from any kind bump or shocks. This Pink Laptop Bag is designed to protect 13.3 inch MacBook Pro or MacBook Air. On the both sides of the main compartment, there are organization pockets for keeping everything organized. It has two medium size open sleeve where you can keep your cell phones, iPod, sunglasses, etc. On the opposite side, there is large size open sleeve pocket perfect for carrying magazines, papers, etc. Besides, there are slots for a pen, pencils, etc. Fits most 13.3-inch laptop. Protects from shock and bumps. Exterior pockets for keeping laptop accessories and other things. Q.1 I really love this bag, Does this comes in any different size? Answer: Currently, It’s unavailable, subscribe to our newsletter, we will inform you once it is available. Q.2 I’m bit confused, don’t know if my laptop will fit into this bag or not, can you tell me its dimension? Answer: Yes! Of course, the approx. The dimension of this pink laptop bag is 14.8 x 11 x 3.2 inches. Buy BRINCH 13.3-inch PU Laptop Carrying Case on Amazon, Now! 15.6 inch Laptop Shoulder Bag by Mosiso is a nicely made laptop bag. It is made of canvas fabric. The canvas outer fabric of this laptop bag is printed with chevron style patterns that enable you to carry you 15.6-inch laptop in a uniquely sleek style. The outer part of this 15.6 inch laptop bag is very beautiful. It is made of very high-quality material and very well made. The exterior part of this stylish laptop bag for women features canvas material and interior part features fluffy soft fleece fabric lining. It has outer pockets on both sides. The large zippered pocket includes the organization sleeves. You can find there two open sleeves for iPhone, iPod, etc. And two slots for pen, pencil or you can use these to carry your sunglasses safely. And the other pockets uses Velcro protection. You can take your iPad/Tablets or personal diary, magazines, etc. Mosiso 15.6 inch Laptop Shoulder Bag offers two carrying option. First one is the top handles that can be used to wear the bag on you forearm or shoulder. If like carrying it as cross body bag or shoulder bag then you can use shoulder straps and adjust it according to your convenience. Mosiso 15.6 inch Laptop Bag is a dedicated laptop bag. To provide maximum protection to your laptop Mosiso Added High-elastic canvas fabric on the surface level then water-resistant neoprene and then soft fluffy fabric on the inner layer. So your laptop will be protected from any kind shock, bump even water. This is the perfect laptop bag for you if you are looking for a cheap laptop bag. Made of durable canvas fabric, includes neoprene water resistant material on the middle layer. Top carrying handles and adjustable shoulder straps. Exterior organizer compartment and two additional Velcro protected pockets for other accessories. Q.1 Is it comfortable to carry the bag as cross body bag? Answer: Of course; The shoulder straps have plenty of padding, so I think you will have a wonderful experience. 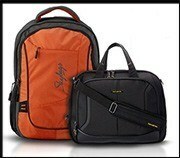 Q.2 Does this laptop bag comes in any other colors? Answer: Yes, it comes in nine different colors. Buy Mosiso 15.6 inch Laptop Shoulder Bag on Amazon, Now! If you are looking for an affordable, durable everyday use laptop bag, then look no further Overbrooke Classic Laptop Tote Bag is your bag. It is a professional looking laptop tote bag for women which can use for travel, everyday college bag and, of course, office bag. This stylish looking laptop bag is made with the nice and high-quality material, and it feels like leather. It is constructed from high-quality, durable nylon material. The stitching of the bag looks great and are well made. As Overbrooke Classic Laptop Bag is a tote bag it doesn’t offer any shoulder strap, and instead it made its top carrying handles long enough to wear on the shoulder even if you are wearing a thick jacket. The shoulder straps are perfectly stitched, so I think you won’t have any breaking issue. Overbrooke Classic Laptop Tote Bag has exterior pockets where you can keep your cellphone, makeup accessories and other essential. Inside the bag, there is two compartment divided using a highly padded divider. The laptop compartment can protect a laptop up to 15.6 inches. The laptop compartment has been padded from both sides. The convenient laptop compartment of tote bag makes it usable for any purpose business, casual or college bag. On the back wall of the laptop compartment, there are large zipper pockets where you can keep you evening purses, sunglasses and something like that. There two open sleeve and two pen slots are attached to the divider. You can use these open sleeve to carry you cell phone, iPod or whatever you like. The main compartment is spacious enough to hold you books if you are a college student. And if are businesswomen then it is large enough to hold you files, folders, presentation material, etc. Made of high-quality, durable nylon and feels like leather. Q.1 I am a college student, can I carry the laptop along with the books? Q.2 What is the dimension of this laptop bag? To make it more easier for you to pick right laptop bag for yourself I have made a list of top 3 best laptop bags for women following the criteria style, price, and combination of both. I love these three laptop bags , if you ask my recommendation then I will suggest you to choose from one these three laptop bags following your needs. View on Amazon, Now! View on Amazon, Now! View on Amazon, Now! I know from above laptop bags, it will be hard to pick one as all they are the best laptop bags for women. I recommend you to make list criteria and to use the above comparison table choose the best laptop bag for yourself. I suggest you to take a look at our buying guide how to choose right laptop bag to get an idea of features you should look closely before purchasing a laptop bag. If you liked my review, please take some seconds and share this as sharing is caring.